PARIS — As he sat in front of a TV to watch last year’s French Open final, sidelined by an injured left wrist, Rafael Nadal had no way to know for sure, of course, that he would return to the height of his powers. For the second time in a row, the most important match at the most important clay-court tournament was being contested without him. As the 2017 edition at Roland Garros began, Nadal’s drought without a Grand Slam title was stretching to three full years. Turned out he could, and he did, as masterful as at any time. Overwhelmingly good from start to finish in Sunday’s final, and for the entire two weeks, Nadal won his record 10th French Open title with a 6-2, 6-3, 6-1 victory over 2015 champion Stan Wawrinka. No other man or woman has won 10 championships at the same major in the Open era. 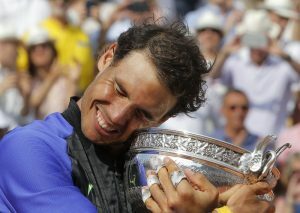 Along with improving to 10-0 in finals at Roland Garros, Nadal increased his haul to 15 Grand Slam trophies, breaking a tie with Pete Sampras for second place in the history of men’s tennis, behind only rival Roger Federer’s 18. Last year in Paris, Nadal withdrew before the third round, making the announcement while wearing a blue brace on his left wrist and resignation of his face. He couldn’t bring himself to watch much of the rest of the 2016 French Open, he said, other than some doubles matches involving a good pal, and the singles final. Nadal won again at Roland Garros in 2006, 2007 and 2008. After a fourth-round loss on bad knees in 2009, he grabbed five consecutive French Opens 2010-14. A quarterfinal loss in 2015 ended that run, and then came last year’s injury. “He puts this doubt in your head when you play against him,” said Wawrinka, who had been 3-0 in Grand Slam finals, including a victory over Nadal at the 2014 Australian Open. Nadal has that way of wearing down opponents. On this day, he was terrific. He won all 12 service games, made a mere 12 unforced errors and won 94 total points to Wawrinka’s 57. One area of significant improvement for Nadal is his serve. Once passable, it is now potent. Confronted with the match’s first break point, 10 minutes in, he solved the predicament this way: service winner at 107 mph (173 kph), ace at 117 mph (189 kph), service winner at 120 mph (194 kph). That would be Wawrinka’s lone break chance. When the ball was in play, Nadal barely missed at all. His groundstrokes were delivered with loud, long grunts, echoing in the otherwise mostly silent Court Philippe Chatrier, filled with 15,000 or so souls too rapt to speak. They did let out a burst of claps and roars in the second set on one particularly exquisite display: Nadal sprinted to his left to chase Wawrinka’s cross-court backhand wide of the doubles alley and whipped a forehand that curved around the net post and landed near a line for a winner.